Blog — San Angel Foods Co. The night before cooking the soup, start by quickly running the beans through your hands or spread them over the kitchen table to pick out any small stones or pieces of dirt that might have sneaked their way into the bag – this can happen with even the best of brands. Rinse the beans thoroughly in running water, then put them in a bowl and add enough cold water to cover the beans by 2 inches. Soak overnight. The next day, drain the soaked beans in a colander and rinse them well with cold running water. Cooking the beans can take several hours, so I recommend using a pressure cooker, but a large pot will work too. Put the rinsed beans in the pot with the chopped onion. Never add salt before the beans are fully cooked, or they won’t soften properly. If you are using a pressure cooker add 6 cups of boiling water, close the lid and cook for 35 minutes at medium pressure. If you are using a regular pot, add boiling water until it is 4 inches above the beans, turn the heat to high and bring to a boil. Lower the heat to medium and cook until the beans are soft (2 to 3 hours). Check often to make sure the beans are always covered in 1 to 2 inches of water; add more boiling water if needed. When the beans are cooked turn off the heat and add the salt and cilantro. 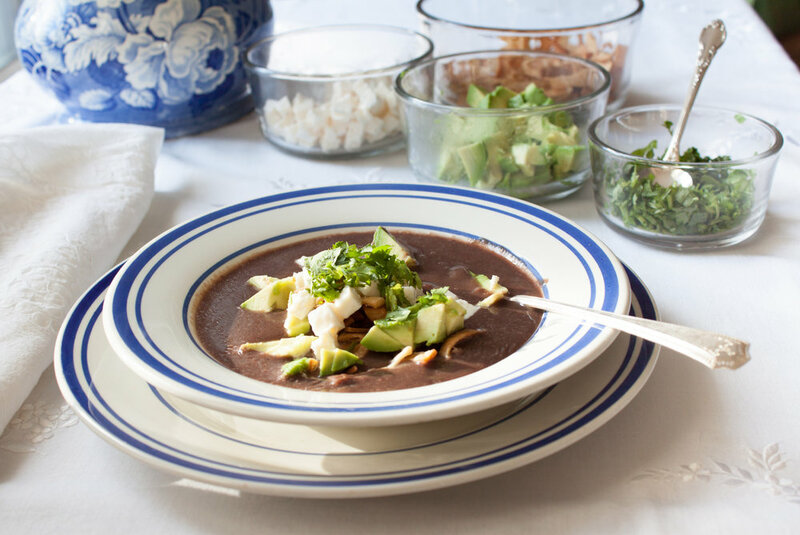 Liquefy the beans (including the onions and cilantro) thoroughly in a blender and then return them to the pot. I prefer using an immersion blender to avoid transferring boiling hot liquid from pot to blender and back. Turn the heat to medium and add 2 to 3 cups of broth or water. It's a good idea to start with only 2 cups and if the consistency is too thick for your liking then add the third cup, keeping in mind that bean soup is supposed to have a heavy-creamy texture. Salt to taste and heat to serving temperature. 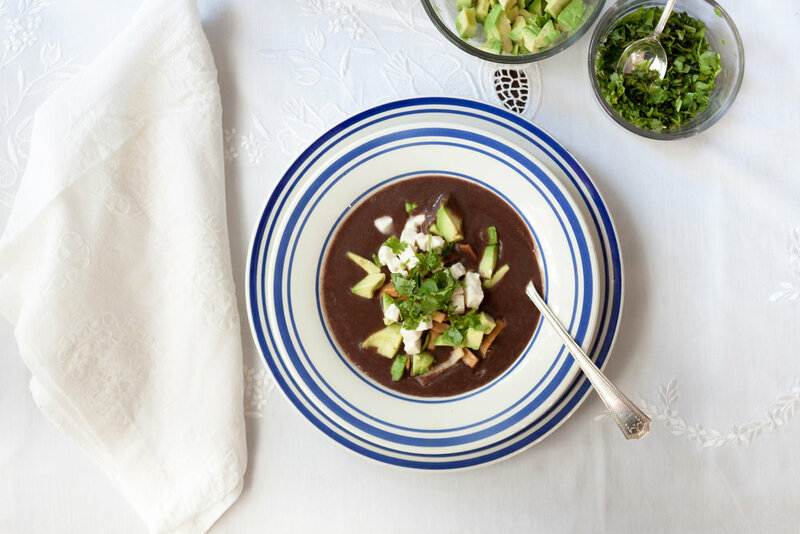 To serve, garnish each bowl to taste with any or all of the following: chopped San Angel Foods jalapeños, fried tortilla strips, diced avocado, diced cheese (fresco or feta if you can’t find fresco), and chopped cilantro.